A non-drug treatment with few reported side effects that works as both an acute treatment for migraine attacks and a migraine preventive. That describes the Spring TMS, which received FDA approval in 2014 and is slowly becoming available throughout the country. Compared to other technologies, Spring TMS’s rollout has lacked much fanfare, but it’s a pretty exciting treatment with a long history of research to support its use. Transcranial magnetic stimulation (that’s what TMS stands for) uses a very short magnetic field to send a brief energy pulse through the skull into brain tissue. The pulse causes very mild electrical currents in the brain that are believed to stop a migraine attack by interrupting the abnormal electrical activity in the brain caused by migraine. My experience with Spring TMS might make you wary. I believe the worsening of my migraine attacks while using it was coincidental, not caused by the device itself. I still advocate for trying it because the research on Spring TMS is quite strong. I also advocate for talking to your doctor about what to do if your head pain worsens while using the device. Here’s what you need to know for getting a Spring TMS, from which doctors can prescribe it and learning how to use it to its cost and how the rental program works. It contains an exact transcript of the questions an eNeura executive answered for me in April. Kerrie: Can any doctor prescribe Spring TMS? If not, how can a patient choose a doctor to prescribe it? 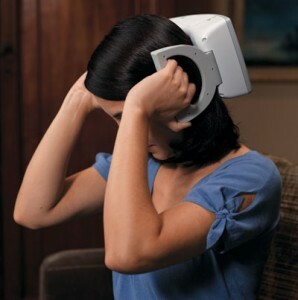 eNeura: The device is currently available by prescription in specialist headache centers around the US. If you want to see which doctors near you can prescribe the Spring TMS email customercare@eNeura.com or call 1(408) 245-6400, and press 1 to speak with a Customer Care representative. Doctors who are interested in prescribing the device can also email or call eNeura customer care. Spring TMS is available by prescription under a rental program. The cost is comparable to other prescribed migraine treatments. The company offers a $300 discount off the first 3 months for new patients. A new 3 month prescription is $450 ($150 per month) plus a one time $50 shipping charge. Total charges for the first three-month period come to $500. As a new migraine treatment, insurance coverage for Spring TMS varies and will likely require documentation of medical necessity from the prescribing physician. eNeura has retained an insurance reimbursement consulting service for patients wishing to pursue insurance coverage. eNeura Customer care will help you get started. Call 1(408) 245-6400, and press 1 to speak with a Customer Care representative. Do you bill insurance? If not, have patients been successful applying for reimbursement from insurance companies? eNeura does not bill insurance companies, but patient’s can submit invoices to their insurance company for potential reimbursement. How does the rental program work?/How does a patient renew a prescription? eNeura: Near the end of the three-month period, the patient’s doctor can send a renewal prescription to eNeura. eNeura, in turn, emails an invoice for the renewal period. Once that’s paid they will mail a new SIM card to replace the original SIM card in the machine. If the prescription is not renewed and the new data card is not inserted in the Spring TMS unit, it stops working. Is special training required to learn how to use the device? It is easy to use and is fully automated to guide the patient through treatment in a step-by-step fashion. While there is no special training required, eNeura offers an individualized program to support you as you begin using the Spring TMS. A Clinical Education Consultant will contact you when your Spring TMS arrives to help you get started and answer your questions. During your first 3-4 months of use, your nurse will continue to support you in your treatment plan, answer your questions, review your diary and report your progress to your doctor. Is the unit shipped directly to the patient or does it go through the doctor? Prescribing doctors send the three-month prescription to eNeura. Once the prescription is received, eNeura prepares the device and ships it directly to the patient’s home. If a patient stops using the device, how do they return it? When a patient receives their SpringTMS in the mail they are instructed to keep the original packaging. If a patient stops using the device, it needs to be shipped back to eNeura. Contact eNeura Customer Care to obtain a prepaid return shipping label. There is no charge for returning the device. What else would you like patients to know about SpringTMS? Many migraine patients are looking for non-drug treatment options. For them medications either don’t work… may be contraindicated or just not well tolerated. SpringTMS offers a safe clinically proven treatment option without medication side effects. Longtime reader Timothy Bauer checked in with eNeura on July 20 after reading my article on Migraine.com. He was told that doctors who have not already been trained in prescribing the device may have to wait several months for training. The company gave him the names of doctors in his area who have already been trained. I have migraines slot and am looking for something to help me. Besides shots that knock me out have medicine I can take but does always help. Can only have 9 pills a month. Cause it stops working. Maxalt 10mg would this be a good thing to try. I have vertigo also which I got last May after having cancer surgery on my kidney. It just hit me real fast. Still have it to this day. I have a VP Shunt. I know that I have to have my shunt checked and sometimes reprogrammed after an MRI. I’m wondering if because this is magnetic based if Enuera is even possible for me? Do you know if this is possible? Lisa-Sue, I don’t know, but I’m sure someone in customer service at eNeura can answer your question. Hi Lisa-Sue. I also have a vp shunt but the non programmable type. This device is unsuitable if you have a programmable shunt as the magnetic field will adjust your settings. Hi, I’ve been suffering from migraine for 35 years. I’ ve tried everything from pressure drugs, epilepsy drugs and seizure drugs for prevention. I’ve used Fioricet, Imitrex, Maxalt, Sumatriptan and others. Is Cerena an option for me? Hi Carmen, it definitely could be, but it would depend on your specific medical history and needs. I recommend calling eNeura, the manufacturer, to see if they can answer specific questions–they can connect you with a doctor who knows how to use the device. It’s being marketed under the name Spring TMS. Hi. My daughter suffers from New Daily Persistent Headache. Since August of 2013, she has had a headache pretty much 24/7 Is there any information on whether the eNeura helps this type of headache. They are known to be one of the most refractory types of headache. My daughter currently uses a Cefaly device. It is helpful in that it keeps her pain level down a little. Since it is helpful and a similar treatment, maybe the eNeura would be even more so. Is this device available in Canada? How would we gain access to this device? Hi Cheri, I’m not sure. I recommend talking to your doctor about it–your doctor will need to be prescribed it if its available. I have suffered from migraines since the birth of my 2nd child. My mother suffered from migraines since she was a young child and now my 13 year old son is showing signs of migraine. I however do not have migraines with aura and have been able to get relief from some medication I get from Nicaragua called Dorixina Relax and Alprazolam used together. However these two medications cause me to sleep for a minimum of 8 hours. It feels like I only get relief from these medications but I can’t afford to fall asleep whenever I get migraines because I have 2 young children. Would this treatment be effective for migraine sufferers with a a family history of migraines and those who don’t have aura? I have been using the SpringTMS unit for about 15 months now for daily chronic migraines. Unfortunately, at least for me, it is NOT the panacea that its marketing claims to be. At first it did reduce the intensity of my migraines but not the frequency or duration. I still needed to take rescue meds at times. However now I have become tolerant to the device. It has become ineffective in treating my migraines. I will be returning it next week and will no longer be using it. – eNeura’s return policy (unless it has changed recently) is that there are no refunds for the unused time if the device stops working for you. – Paying for it on a yearly basis reduces it cost by $700/yr but you run the risk of eNeura’s return policy. – To the best of my knowledge it is not covered by Medicare or most insurance plans that I am aware of. eNeura refuses to bill insurance companies. – I have received no contact from the company in regards to my usage of it, side effects, satisfaction, issues, etc. after the first 3 months of having it. – For those people living in the San Francisco Bay Area, you can pick up and return the unit directly from the companies headquarters in Sunnyvale and avoid the $50 shipping charge and any $10 sim chip mail charges that eNeura levies shipping. – I have been using the original unit. When I renewed my prescription after the reduced cost trail period, it was indicated that I would be received a new design that was smaller when it was released. That never happened. – The unit cannot be purchased. It only can be leased. That means you are continually paying for it for the entire length of time you have it in your possession. My conclusion: If this device actually works for you over an extended period than it may be worth the money. However if you do decide to use it, based on my own personal experience, don’t expect outstanding customer service or any help with insurance or expenses. Don’t be fooled by its marketing. It is not, in my opinion, a ‘magic bullet’ for migraines. If your migraine responds favorable to it over an extended period it might be a solution for your adversity. But it will not necessarily work for every migrainer. We leasing the machine, given eNeura’s return policy, go slowly. It is worth paying a bit more at first for short term use rather than for a longer period and losing a significant amount of money should you become tolerant to it. Once you trust it to work for longer periods, go for it and save considerable dollars. Also keep in mind that newer migraine treatments have just been released and several others are on the horizon. Always remember that the best treatment for you migraine is the one that works the best for for you, with minimal side effects, both physically and financially.